I know I skipped a week, oh well. I have news. I moved to London. I have now been writing on this blog from four different home countries, and we are counting because knowing me it might be five in a year. I have just come to terms with the fact that I am a wandering soul, and I don't care to change it. This planet is our home, not just four walls we pay money to live in (too much in London for gods sakes). Im just going to enjoy my life and keep wandering. I was basically eating this everyday before I got here. 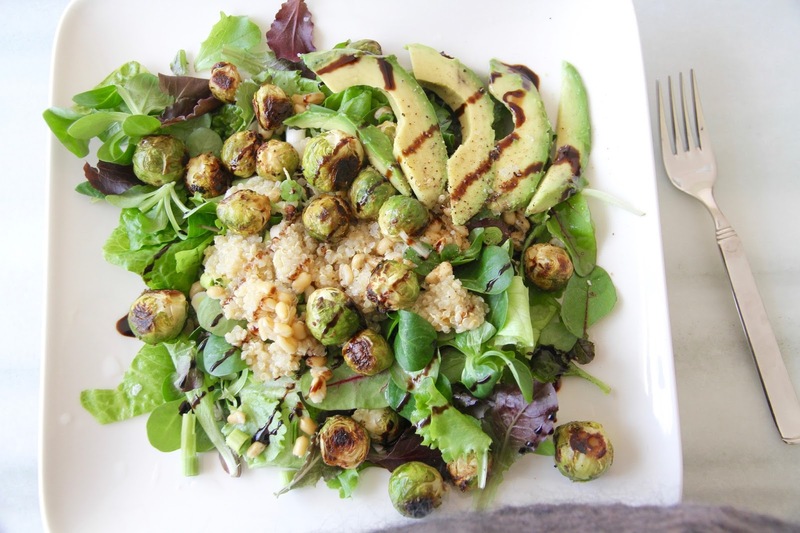 I've said it before, I could live on salad, but sometimes, especially when you exercise a lot, you might want a little more substance to your meal and even 'gasp' a little extra protein, for which Quinoa is a GREAT source. So don't you worry little athlete, I got you covered. *This recipe goes amazing with a Lemon Tahini dressing. Its just lemon juice, 2 tablespoons of tahini, salt, pepper and if you like a little olive oil. Most of the ingredients are quite self-explanatory: Wash the lettuce, slice the avocado, cook the Kamut (or get it out of a can), and cut the baby spring onion. The Quinoa however has a little twist to it. I actually didn't cook it myself, but my friend Stefan did. He came up with the genius idea to cook the quinoa in veggie broth. Its probably not revolutionary to some of you, but I had never made it that way before. So what he did was basically just soaking the Quinoa in water over night, getting rid of the water and cooking it for 10 minutes in the broth. The amazing taste came from the fact that Stefan actually made the broth himself too, so just carrot, onion, parsnip, potato, leek... whatever you decide should be in it, and then reuse the cooking water. So thats the Quinoa. The brussels were made in the oven, highest temperature about 20-30 minutes I believe. Just toss them in a little olive or coconut oil add some salt, maybe some nutritional yeast and lemon and let them cool off before adding them to your salad. When you put everything on your plate, I like keeping the ingredients separate so I can taste each of the veggies and grains in their full beauty, I added some lemon salt and pepper on the avocado and drizzled some balsamic glaze over it. As you saw above I suggested a dressing for this, but you really don't need one. 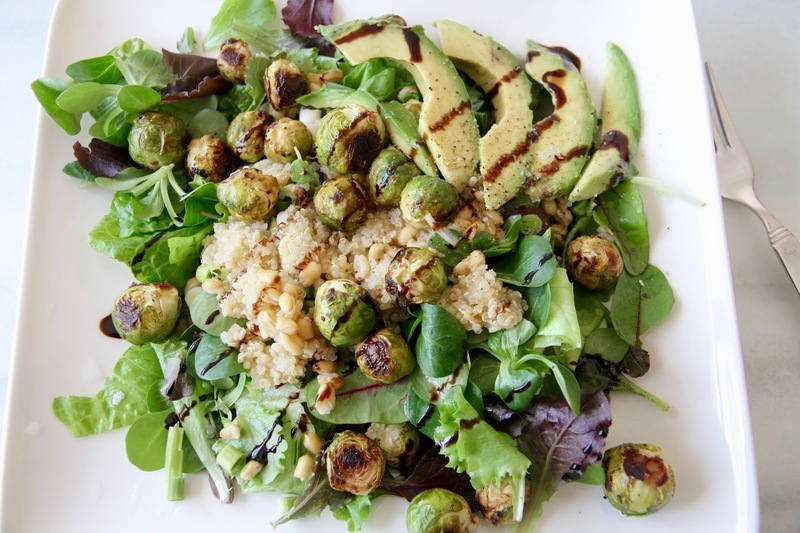 The avocado is creamy and thick enough to bind it all together, and the quinoa also does a great job of making it into 'a meal'. I sincerely hope you enjoyed this. Thanks, i will try this asap. It looks amazing. Have a good time in London.